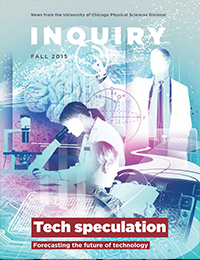 This article originally appeared in the Fall 2015 issue of Inquiry, the biannual publication produced for University of Chicago Physical Sciences Division alumni and friends. Chuan He breaks new ground in RNA and DNA epigenetics. Three billion—the number of base pairs in the human genome—sounds like a huge number. But of those billions of bases, humans appear to have only about 19,000 protein-coding genes. And while that may sound like a large number as well, those genes alone can’t account for the vast complexity of a human being with trillions of cells, all with their own identities. The standard flow of information coded into DNA, transcribed into RNA, and translated into protein provides too small a genetic template to accommodate the diversity of living systems. This discrepancy can be explained in part by epigenetics: changes to gene expression that don’t change the underlying DNA sequence. Epigenetics “is basically a coding process,” says Chuan He, the John T. Wilson Distinguished Service Professor in Chemistry. The DNA sequence is a predetermined template, but one with hundreds of millions of spots that can accept chemical flags that alter gene expression. One such template modification is methylation. Three classes of proteins carry out epigenetic coding: “writer” enzymes that apply tags or marks, “eraser” enzymes that remove the marks, and “reader” proteins that recognize and bind to the marks. This tagging provides an additional genetic coding process, expanding complexity exponentially, and explains, for instance, how cells with identical genome sequences can develop into different cell types. A deeper understanding of epigenetics provides insight into essentially all life on earth. For almost half a century, geneticists have studied DNA methylation. For about three decades, they have been studying the same type of modifications on histones—the proteins around which DNA coils. But until recently, partly for practical and partly for conceptual reasons, no one considered the role RNA might play in epigenetics. “In the beginning, it was easier to study DNA and histones,” says He. “They're much more stable. You can isolate them and perform various analyses.” And because RNA has a shorter half-life inside cells, scientists thought it might merely be a template that transfers genetic information from DNA to protein. Yet in the past few decades, as more capable analytic sequencing technology has been invented, researchers have discovered that RNA plays major functional roles in many processes. He, who joined UChicago in 2002 and now directs the Institute for Biophysical Dynamics and is a Howard Hughes Medical Institute Investigator, came to study RNA via the scenic route. A synthetic chemist who had worked in organic synthesis, he also studied biochemistry; investigated pathogenic bacteria with Olaf Schneewind, the Louis Block Professor in Microbiology; and later collaborated with Tao Pan, professor in biochemistry and molecular biology, on RNA biology. Researchers have long known about RNA methylation, but they believed it was a static state, playing a minor role. In 2010 He—who had been working on DNA epigenetics—discovered the first RNA demethylase, called FTO, an eraser that removes a methyl group from RNA. His discovery proved that RNA methylation is reversible and thus a dynamic modification. Publishing the research in 2011, He’s lab founded the research field of RNA epigenetics. He’s team went on to discover and describe the writer, eraser, and reader proteins involved in RNA methylation. Focusing particularly on the readers, which ultimately affect the cell’s biological functions, He is gaining a mechanistic understanding of the methylation pathway, with “the implication that this is going to impact most biological processes.” He suspects his lab will have a complete characterization of the reader functions in a couple of years. The next questions to address are how and why the erasers regulate demethylation and the writers selectively restore the mark. And in the longer term, how these proteins and pathways affect or control cell differentiation, development, and human diseases. While He is making waves in RNA, he hasn’t given up his DNA work. A recent revelation, in fact, links back to his field-making RNA discovery. Scientists know that the DNA base cytosine gets methylated in both multicellular and single-cell organisms alike. (Cytosine methylation is the most thoroughly researched and best understood epigenetic DNA mark.) The DNA base adenine was thought to be methylated only in bacterial cells. However, homologues of the RNA demethylase protein that He’s lab discovered remove a methyl group from adenine in multicellular organisms. With associate professor Laurens Mets in molecular genetics and cell biology, He set off to find methylated DNA adenine in eukaryotes, and they did—in algae, worms, and fruit flies. The discovery led to three Cell papers published in April by He’s group, a team at Harvard, and a team in China. The DNA mark is also found in mammals, according to as-yet unpublished data.